My recommendation with any MashUp is to always make at least a muslin of both patterns per the regular instructions before mashing them together. That way you will know their individual quirks and be sure to have the correct sizing. Here you can see the originals I sewed for Bean, as well as a bit of a review of the two patterns. 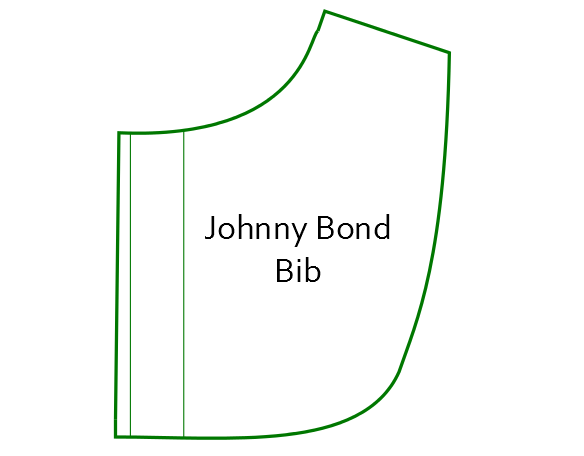 For the Johnny Bond MashUp, I wanted to use the bib feature of the Bond Top, but have the placket and hood from the Johnny B Good Hoodie. There aren’t a lot of alterations to make, but lets go through them. 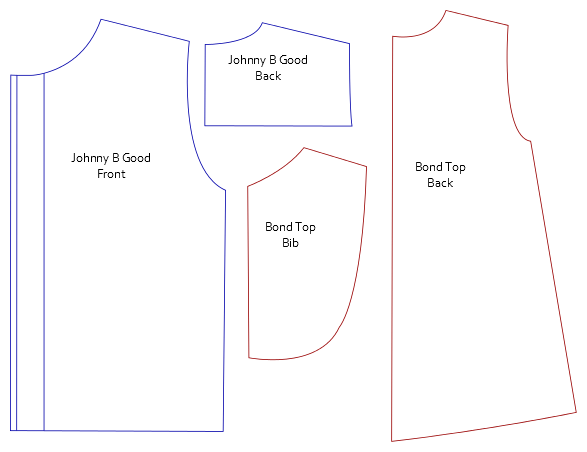 The four pattern pieces you’ll need to alter are the Johnny B Good Front and Upper Back and the Bond Top Bib and Back. Trace the pieces in your correct size. Make sure to mark the seam allowances. 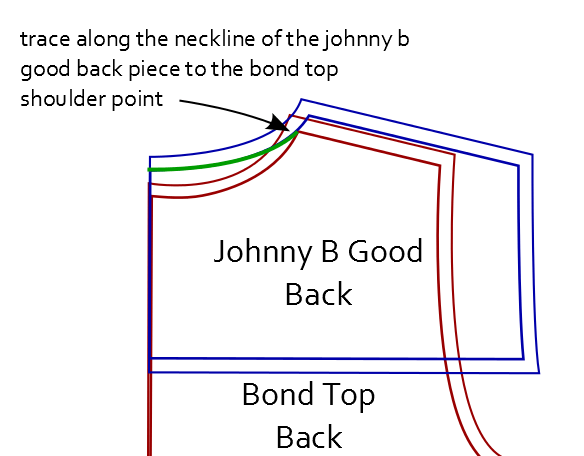 The Bond Top uses 1/2″ and the Johnny B Good uses 3/8″ which will need to be taken into consideration in the following steps. Take the Johnny B Good Front piece and the Bond Top Bib piece and line them up at the neckline shoulder seam. It is important to remember to line them up right at the seamline and not at the seam allowance outside point. 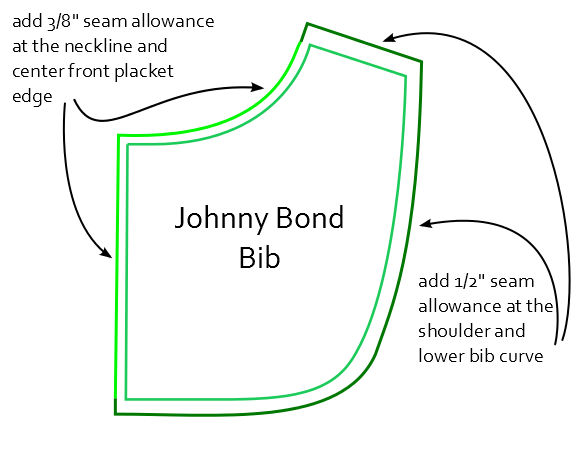 Since we are using the Bib front of the Bond Top, but the neckline of the Johnny B Good pattern, we need to alter the bib shape. 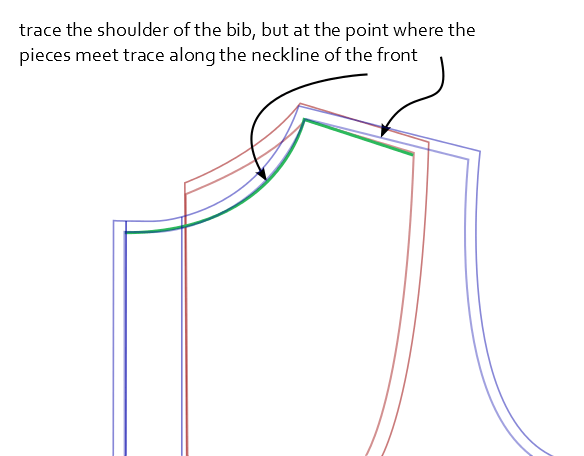 Trace along the shoulder of the bib and then the neckline of the Johnny B Good front. The front piece has a placket included, but the bib is meant to be cut on the fold. 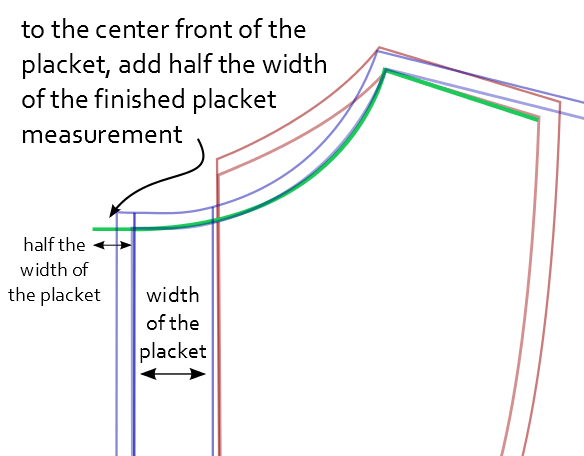 We will use the placket from the front, but the center of the placket once created will need to end up on the original bib fold line. 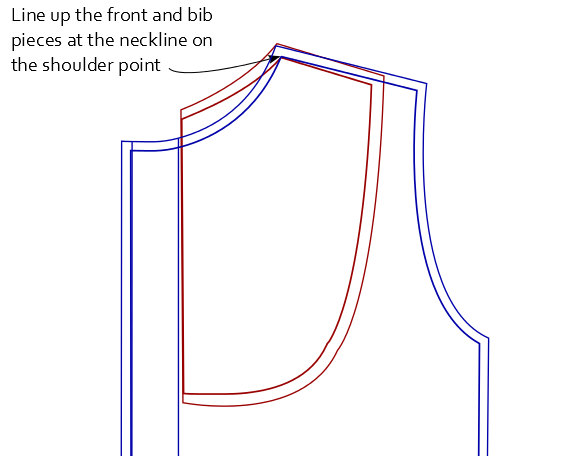 To achieve this, to the center front edge of our new bib piece we need to add half of the width of the finished placket. 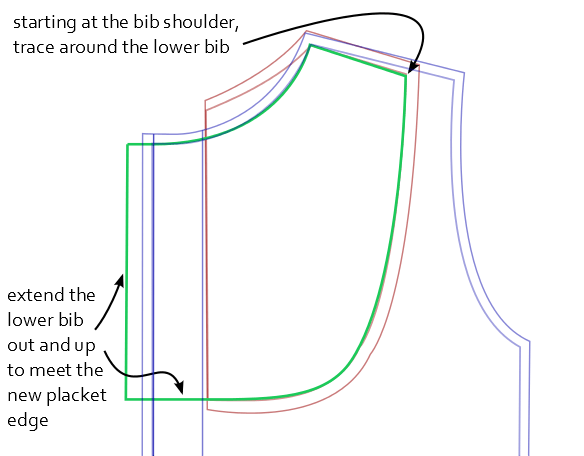 From the original bib shoulder point, trace around the lower edge of the bib, extending it out and up to meet the new placket edge. 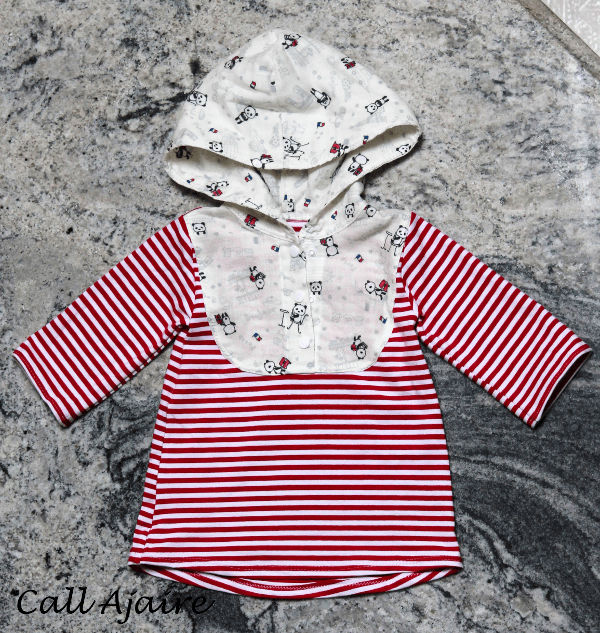 Add 3/8″ seam allowance to the neckline and center front edge and 1/2″ seam allowance to the shoulder and lower bib curve. 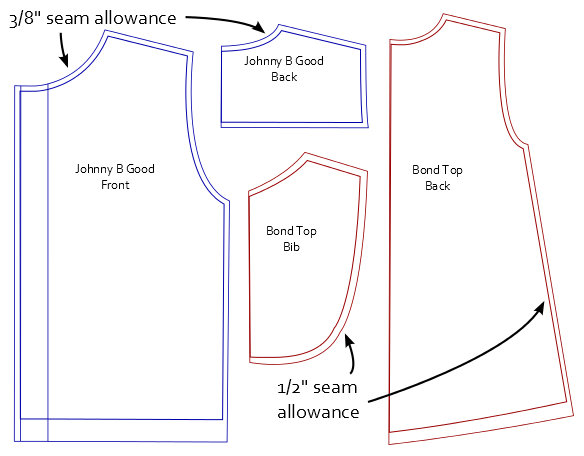 Add the original Johnny B Good placket fold lines to the center placket and the new Johnny Bond Bib piece is complete. 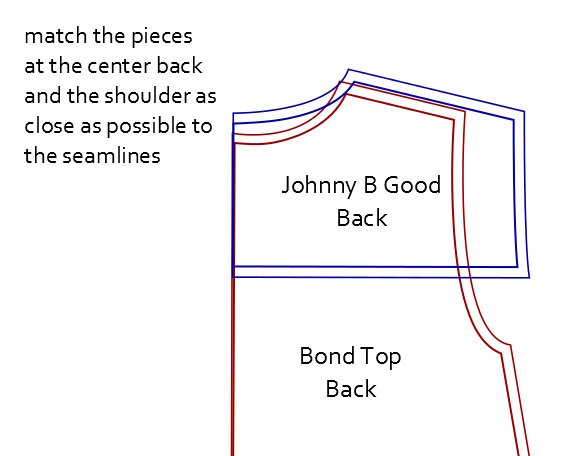 For the back pieces, line them up so the center backs match and then shift the Johnny B Good until the neckline meets the Bond Top shoulder. Be sure to match the seamlines and not the outside seam allowances. 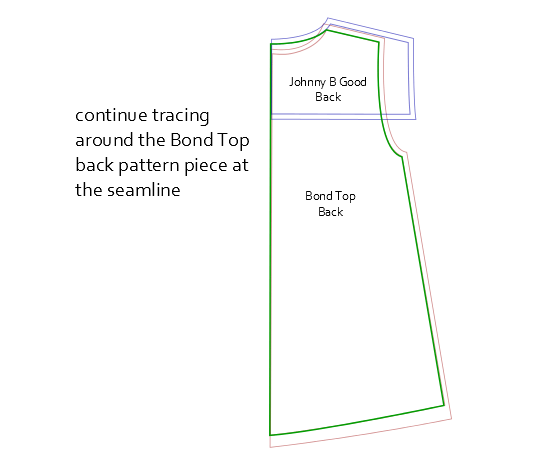 Starting at the center back, trace along the neckline until you meet the Bond Top shoulder. Continue down the Bond Top shoulder and around the rest of the Bond Top back piece. Add the 3/8″ seam allowance to the new neckline and 1/2″ seam allowance to the rest of the seams. 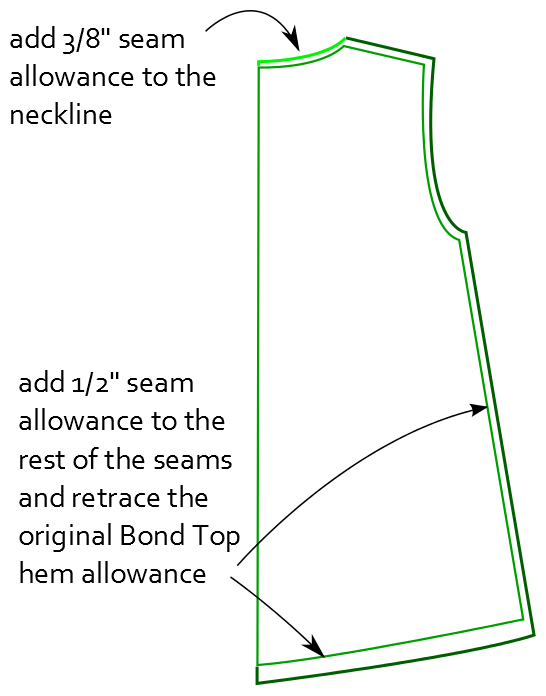 Retrace the original Bond Top Hem allowance. Cut out 2 (reverse 1) Johnny Bond Bib pieces not on the fold of the woven fabric and 1 Johnny Bond Back piece on the fold of the knit fabric and follow the original patterns for how to cut out the remaining pieces. Then, come back on Thursday and we’ll sew everything together!